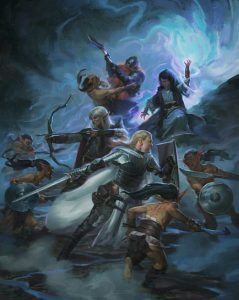 HomeDungeons and DragonsMechanics DiscussionWhat’s an Encounter in D&D 5e? Encounters in D&D are the essence of the game. It can be many things, such as an epic battle, or an elaborate puzzle. Unlike many RPGs, D&D revolves around its encounters. While there is plenty of role-playing and storytelling, it all comes back to fighting that dragon or the big bad of the campaign. To quote Matthew Colville in this video “…an encounter is anything that stops the players’ forward progress and challenges them.” He goes on to say that combat, traps, and puzzles are all types of encounters and shows some great examples. Definitely watch his Running the Game series. It’s by far some of the best advice I’ve found for DMing. Encounters should stop the players’ forward progress, challenge them, and be fun. Not every encounter has to be memorable or even interesting, but there are a few key rules to follow. First, let’s go into more detail on the three different types of encounters that were mentioned in the video. Combat is the bread-and-butter of D&D. The default state of encounters in D&D 5e is some form of a combat encounter. Be it a difficult boss fight or a pack of goblins, you’ll have plenty of these throughout any given campaign. The rule of thumb for combat encounters is to vary the difficulty from encounter to encounter. Not every combat should be one big boss fight or battle against 4-6 creatures. Change it up! There are two ways to go about designing combat encounters. Planned encounters and random encounters. Goblins are common for low-level combat encounters! Art by Wizards of the Coast. These are combat encounters that you have specifically planned to happen. You have chosen creatures that fit the theme of the scenario you have created. This encounter has been placed in a specific place in the world or adventure. There may be obstacles that you have designed to fit this encounter. The point is, the DM has taken the time to create this combat encounter. For most games, this will be the vast majority of encounters be it a homebrew or pre-made adventure. 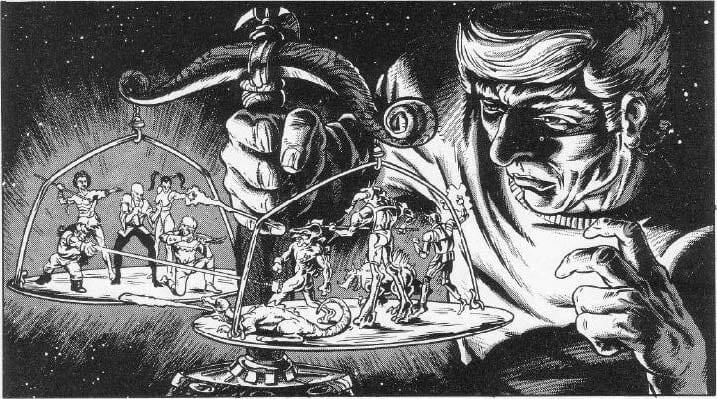 The encounter the DM or module created was made for a reason and there were specific obstacles in mind for the party to overcome. The combat encounter is a vessel to move the plot forward in some way or another. Random encounters are combat encounters that are generated on the fly. An encounter is typically chosen by using either a program or by rolling on a random encounter table. Generally, random encounters are used for encounters that don’t need to move the plot in any direction. For example, if the party is traveling the DM may wish to throw an encounter at them. They’ll roll on the table or run the program and throw whatever creatures pop up at the party. With either of these options, a DM can list certain creatures they would like to be potentially chosen. This ensures that the encounter will still work with the theme or setting that is being conveyed. Regardless, it is still entirely random which combat encounter is chosen. Traps are a great way to add variety to any dungeon or adventure. Treat traps like you would any combat encounter when you go to design them. A good trap should have the potential to drain the party’s resources. Resources can be hit points, class resources like ki points, or spell slots. Put the party’s rogue to good use! On the other hand, a trap does not always have to be something that the rogue can disable. Spells such as setting off an alarm spell can be a trap too! Maybe the alarm creates an additional combat encounter or sets off a different chain of events. Traps also don’t have to lead to combat or direct damage to the party. If a pressure plate triggers a huge stone slab to drop and seal off the hallway, the party will have to move this slab. Maybe they’ll have to take a level of exhaustion from attempting to move it, or they’ll burn a spell slot to move it. As long as the trap has the potential to use up party resources or impose a condition, count it as an encounter for that game day. The Golden Idol scene in Raiders of the Lost Ark is an example of traps & a puzzle creating an encounter. Credit to Paramount Pictures. Puzzles are the one encounter that I find to be a challenge to incorporate into my games. They can be extremely fun, but a good puzzle can take a bit of time to create and set-up. I tend to use one puzzle for a dungeon, just to mix things up for the party. A puzzle could be a riddle, an elaborate logic problem, or anything in between. Typically they do not directly involve combat, though an incorrect answer could create a combat situation or a trap encounter. Similarly to traps, the DM should think about what resources will be drained during this encounter. For example, if a player says an incorrect answer for your riddle maybe a fireball shoots out of a statue. That will drain the party’s hit points and cause them to use spells to heal or hit dice and one of their short rests. A puzzle does not have to drain party resources either. Puzzles can also drain the clock. If the party is in a rush to get to their destination a puzzle may slow them down. This could have a number of effects such as creating a different outcome for the situation. There are four possible difficulties of an encounter in D&D: easy, medium, hard, and deadly. An easy encounter is typically not much of a challenge for the players. They may spend some minor spell slots or lose some hit points in an easy encounter. A medium encounter is more challenging. Players will spend spell slots and class resources. They also will lose hit points and could potentially be knocked unconscious. Hard encounters are challenging. High-level spell slots will be used and class resources will be expended fairly liberally. There is a chance for at least 1 player to die in the encounter. Deadly encounters are extremely dangerous. The party may have to utilize every resource they have. Total party kill (TPK) is absolutely possible. The suggested amount of rest for the players is 2 short rests and 1 long rest per day. The rest of this section is dependent on you giving your party this number of short and long rests per day. On page 84 of the Dungeon Master’s Guide, there is a chart that details how much adjusted experience (EXP) per day a character can complete. Multiply that number by the number of characters in the party and that’s the max EXP you should throw at a party in a single day. Doing the math and some rough estimations I was able to translate this into a set number of encounters per day. A party can complete roughly 12-14 easy, 6-8 medium, 4-5 hard, or 3 deadly encounters in a single day in-game. You can also throw a combination of these difficulties at the party. The level of difficulty of an encounter is dependent on the level of the party. A deadly encounter for a group of level 2 characters will probably be an easy encounter for a group of level 10’s. Page 82 of the DMG has a chart of difficulties per adjusted EXP that you can reference. You can also use Kobold Fight Club or other calculators to check the difficulty of a combat encounter. I wrote a post on Kobold Fight Club recently too. In a balanced game, they should be completing multiple encounters per day. Vicious_snek on /r/dndnext wrote a post about how it is important for classes that rely on short rests to have multiple encounters per day. Otherwise, classes that do not require short rests to replenish their resources will outshine them. If you regularly throw a single large creature against a party in a game day your wizard’s high-level spells can all be dumped in a single encounter. However, if you have 4 easy, 3 medium, 2 hard encounters throughout 2 short rests, your monk will be able to shine just as much as that wizard. Not every game day has to be a single session of your campaign. Just like not every game day has to be mentioned in your campaign. It’s just like real life, some days we do tons of interesting and memorable things. Most days we’re at work or school and don’t do anything of note. Don’t be afraid to have a single game day be 2 or 3 sessions, your monks, fighters, and warlocks will thank you for it. Learning how to create balanced encounters is both necessary and difficult. The only real way to learn is to try. Sometimes your encounters will be underpowered, sometimes they will be overpowered. It will entirely depend on the skill of your players, party make-up, and of course, the number of magical items the party has. Every game will be different. It’s difficult to gauge the difficulty of traps and puzzles compared to combat as they do not have a set EXP value like creatures do. One trick I use is to use these descriptions as a reference then look up the value of a creature or encounter of similar difficulty. Also, you can assign this EXP to the puzzle or trap for when you distribute the EXP to the party after they overcome it. Finally, if you are looking for more information, read through pages 81-87 in the DMG. It contains excellent information on creating and running encounters!